The Finger Lakes region is one of only six areas across the country chosen to participate in ReThink Health Ventures, a health innovation project funded by the Fannie E. Rippel and Robert Wood Johnson Foundations. The two-year project will help six organizations already active in the Finger Lakes come together to improve care, increase access and lower medical costs. 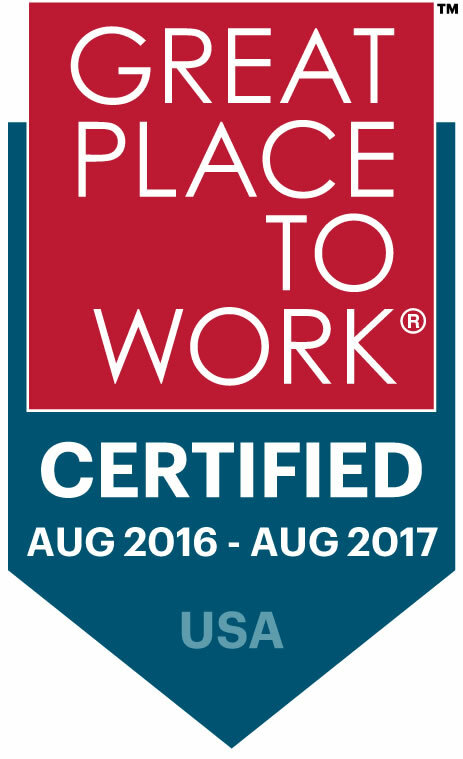 Joining Finger Lakes Health Systems Agency will be Finger Lakes Performing Provider System, Greater Rochester Chamber of Commerce's health care planning team, Monroe County Department of Public Health, Rochester RHIO (Regional Health Information Organization) and United Way of Greater Rochester. 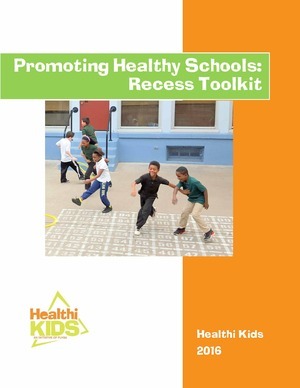 New from Healthi Kids and available online is the Promoting Healthy Schools: Recess Toolkit, 112 pages of resources on indoor and outdoor activities and tips for promoting healthy eating and physical activity for children. The toolkit builds on work Healthi Kids has been doing with the Rochester City School District on harnessing the power of play and physical activity. Most recently, Healthi Kids hosted training for educators in five schools on healthy recess, playground games and group management. Homeless veterans and individuals struggling with substance abuse in the Finger Lakes region have a new option for help, thanks to Finger Lakes Area Counseling and Recovery Agency. The Clifton Springs-based agency has opened a $2.62 million supportive housing project at sites in Ontario, Seneca, Wayne and Yates counties as part of New York’s $20 billion homelessness and affordable housing action plan. “Kudos to FLACRA for putting a priority on transitional housing for those in recovery, which is desperately needed in our community,” said Trilby de Jung, CEO of FLHSA. 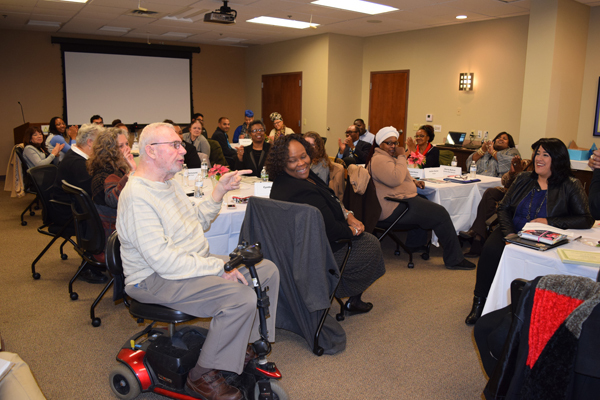 Above: Members of the African American Health Coalition, Latino Health Coalition and Partnership on the Uninsured gathered in December for a brief business meeting and their annual holiday celebration. View a gallery of images from the event here. 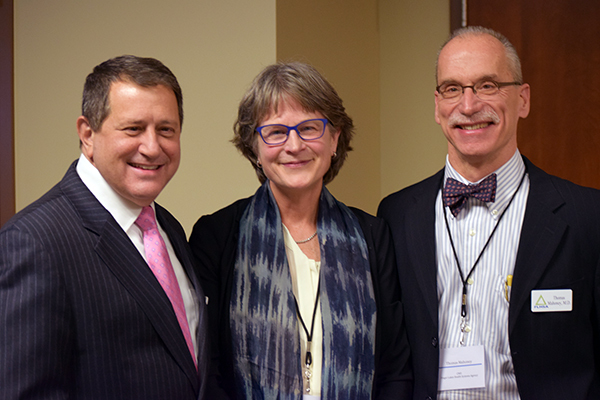 From left, New York State Assembly Majority Leader Joseph Morelle, CEO Trilby de Jung and Chief Medical Officer Dr. Thomas Mahoney highlighted the success of FLHSA's Centers for Medicare and Medicaid Innovation award during a celebration with staff and members of the Rochester Health Innovation Collaborative in November. The initiative in 65 primary care practices showed a 50-percent drop in hospital admissions and a 40-percent drop in emergency room visits for people who received care management. Learn more about the demonstration project here. PCORI.org - Dr. Patrick Conway, deputy administrator for innovation and quality and chief medical officer of Centers for Medicare and Medicaid Services, held up Rochester as an example of collaboration on social determinants of health and clinical care in his keynote address at the annual Patient-Centered Outcomes Research Institute annual meeting. Look for the mention at 12:27, about two-thirds of the way through the video. To receive this newsletter each month, opt in here.